An evening in Florence is extremely magical. 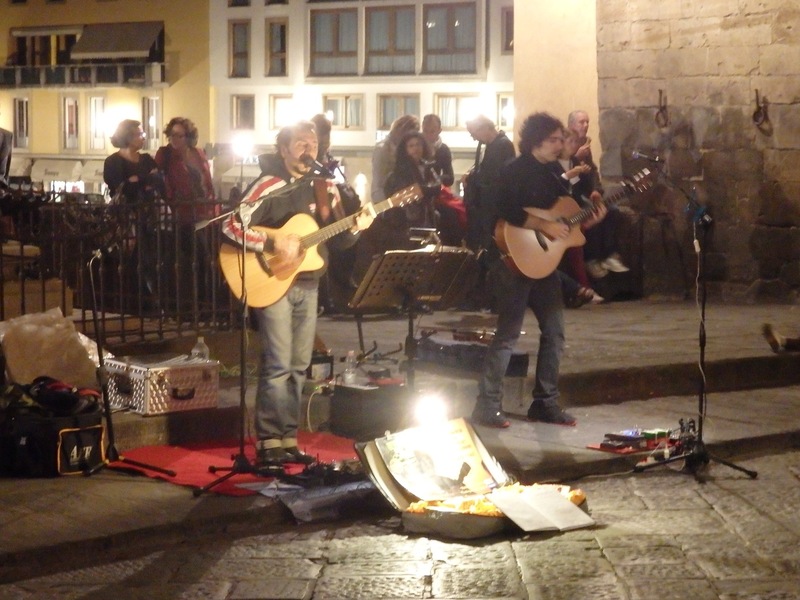 Everything comes alive, from the medieval architecture to the roving bands of locals and tourists alike. You are never far from eye-catching structures that soar skyward into the dark abyss. 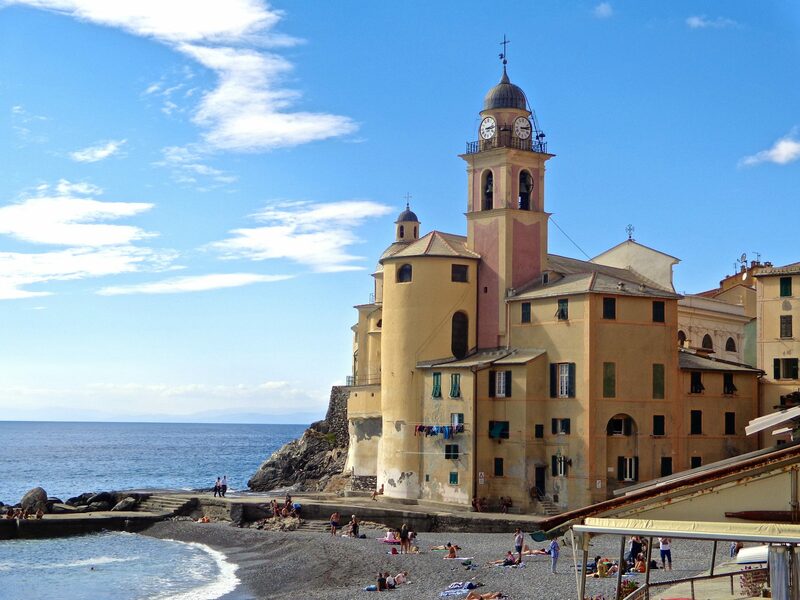 Charming cafes and trattorias full of chatting people line the winding cobbled streets. Merry-making is in the air. 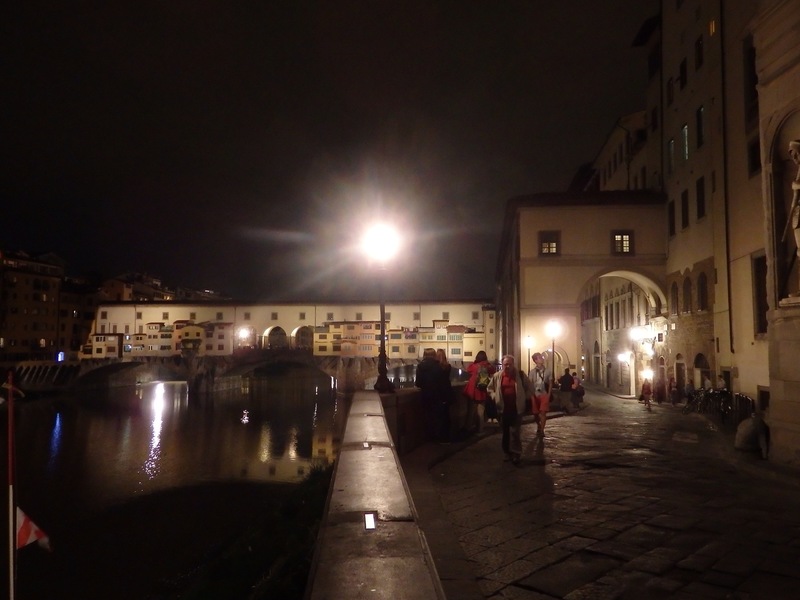 The Ponte Vecchio, or ‘old bridge,’ was once lined with butcher shops. This is no longer the case, thank goodness. Today it is bedecked with lovely jewelry shops. You need not wander far before you hear the beat and rhythm of a nearby local band, wholeheartedly doing their best to entertain you. Giorgio Vasari, early sixteenth century architect, was commissioned by the Medici to build a corridor that ran from the Uffizi Gallery to the Medici Palace on the opposite side of the Arno River. Here you can see the corridor continue over the top of the shops with its neat line of square windows. 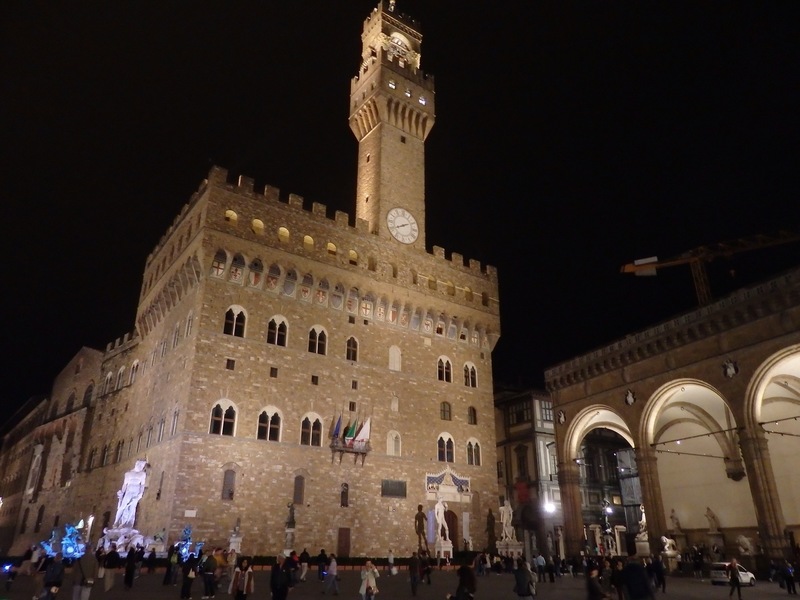 Medieval and dauntless stands the Palazzo Vecchio, an important landmark of Florence since 1322. Constructed by Florentine architect Arnolfo di Cambio, the impressive Romanesque-style crenelated fortress is rock-solid. A huge bell at the top of the tower was used to call the citizens to meetings or warn them of fire, flood or enemy attack. 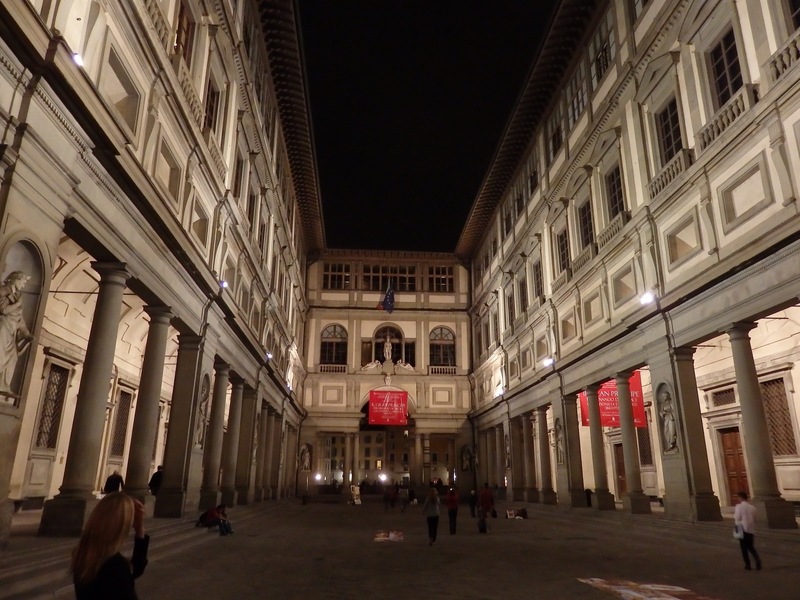 To the right you can see the looming arches of the outdoor “sculpture museum,” called the Loggia dei Lanzi. Notice below the magnificent display of light and shadow on these figures in the Loggia. They appear very dramatic, especially at night. Across from the Palazzo Vecchio on the Piazza della Signoria is the Loggia dei Lanzi, built in 1382 and designed by Orcangna. 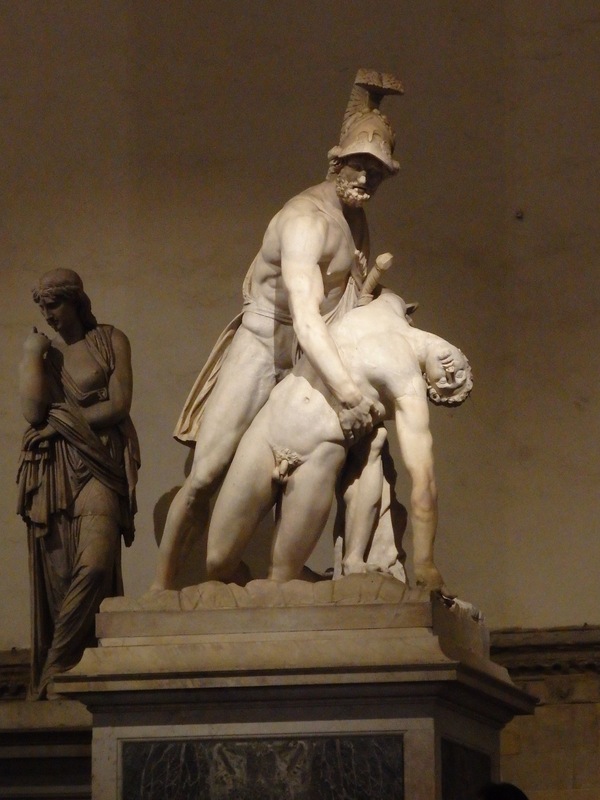 It was named after the Lancers, the bodyguards of Cosimo I who took up lodging on this spot. The Loggia is actually an outdoor museum, with twisting and grasping statues that appear especially spectacular at night-time. Cosimo I de’ Medici hired architect Giorgio Vasari to build offices for the Florentine magistrates in 1560. 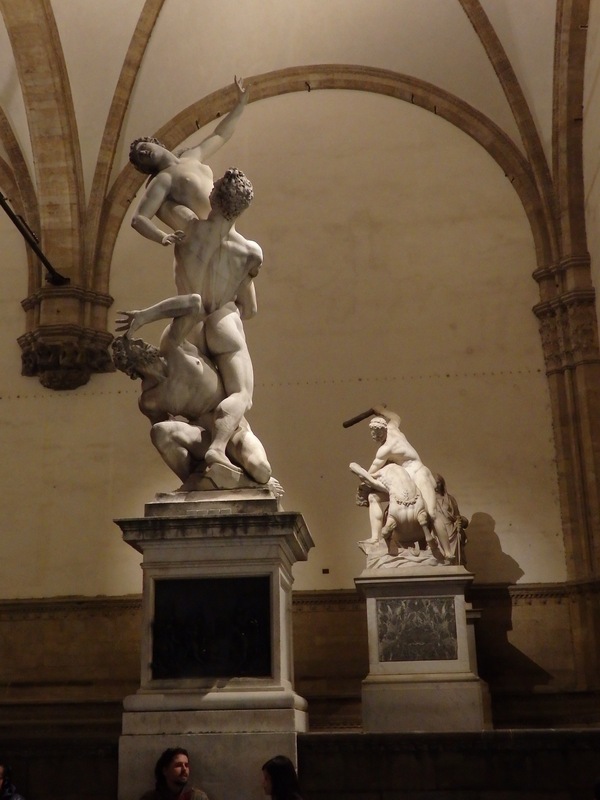 Later, after the fall of the ruling Medici’s, it became a museum officially open to the public in 1765. Today it houses many famous paintings by the masters. Giotto, Botticelli, Leonardo da Vinci, Raphael, Titian and Caravaggio lead the parade. 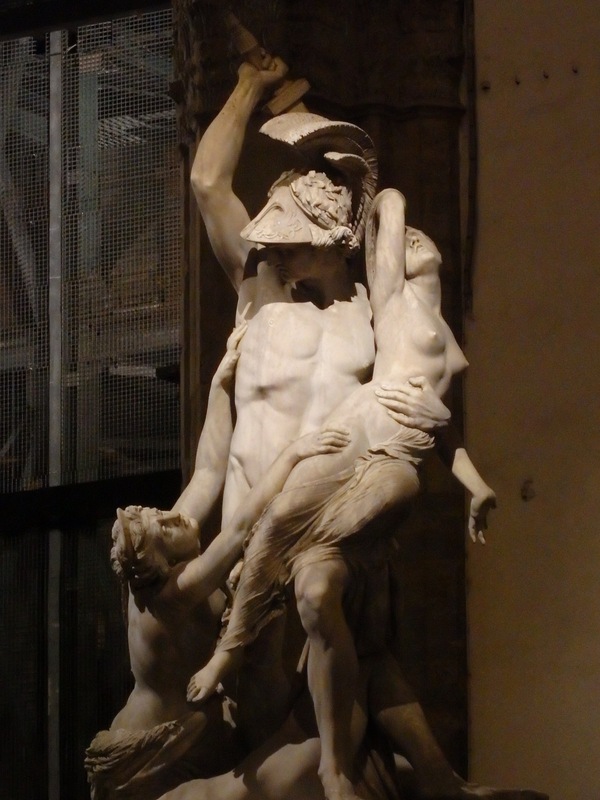 Florence by night is an entirely different world. It is a world of artistic appeal to the senses, of mystery and intrigue. A world revealing shades of a former time. Wonderful photography and discussion of my favorite city in the whole world. 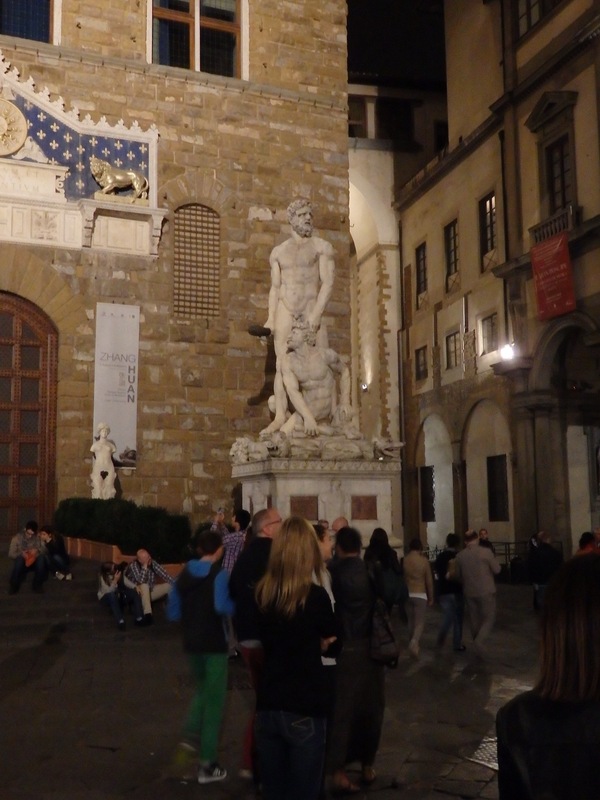 Firenze by night should definitely be part of the itinerary of anyone visiting here. It certainly looks like Florence lights up at night by your photos, Susan. The energy looks friendly and alive. On your other post about winter — we’re just coming out of the deep freeze ourselves and it’s starting to warm up here. I also wanted to let you know I nominated you for another award (Blog of the Year 2013 Award). Hope you can accept. http://plaintalkandordinarywisdom.com/happy-surprises-nearing-the-end-of-this-year-blog-of-the-year-2013-award/. Thank you, Pat. Glad to hear you are warming up in your part of the world! I would be delighted to accept your nomination for Blog of Year 2013! Thank you!! Susan, you’re truly welcome on the award and I’m happy that you accepted. I love your posts, photos of all the beautiful sights in Italy and history. Thank you Pat! And you as well….you are a talented writer who writes with so much care and tenderness. You bless my life through your posts and our correspondence. You’re welcome, Susan. I love your warm words — thank you so much. It means a lot to me that my writing can touch hearts and have meaning. My life is blessed too through our connection here on the internet. Hi Joan! 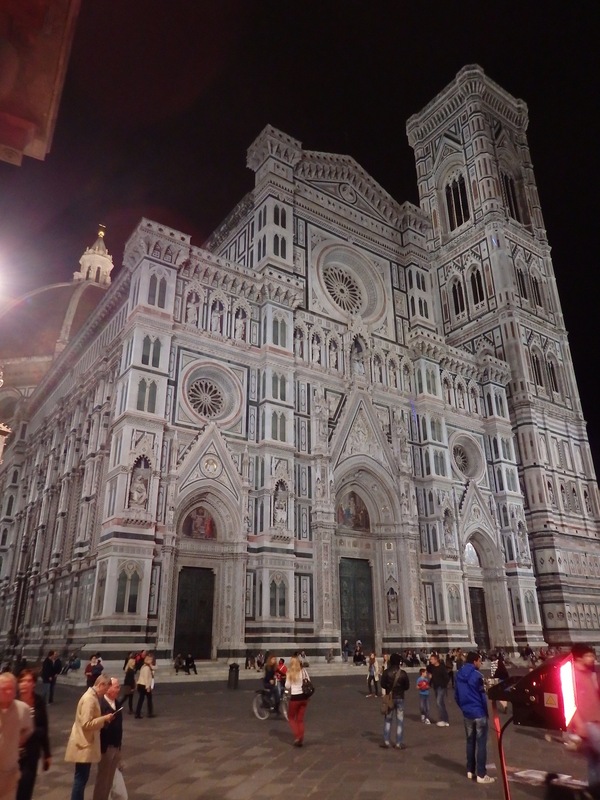 Thank you…I have yet to experience Florence during the Christmas season. The night time decor would be fabulous I am sure. I hope you will be back in 2015…. Beautiful, and what a difference at night! I took almost the same photos a couple of weeks ago, but during the day. Yours make me wish I were back again! JoAnn, thank you! Night time really does change the appearance of things we see during the day. Even the effect is very different. 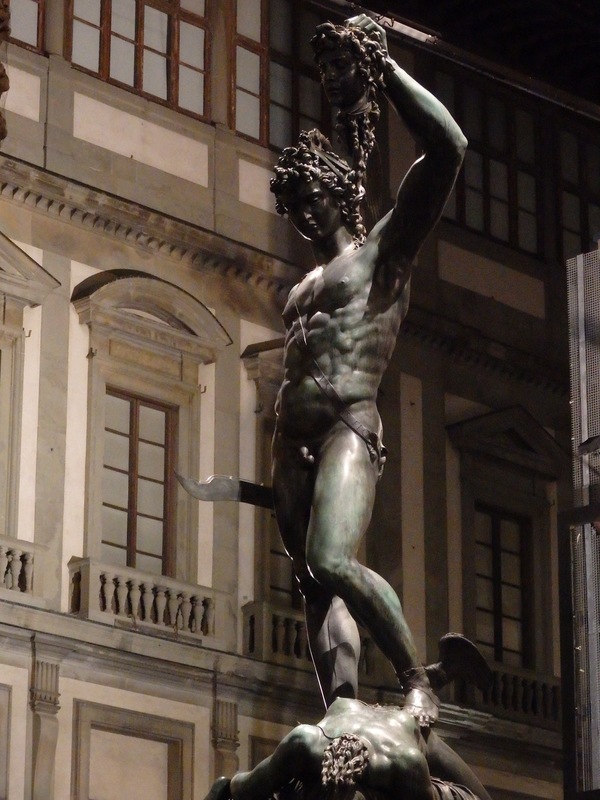 I was wishing the same thing while I was writing it….Florence, here I come! Great photos. I enjoyed them as usual. My memories of Florence at night also add the Christmas tree by the Duomo and the merry-go-round in Piazza della Republica. Maybe 2015 I will see them again I hope.